tl;dr: In the second part of our four-part series about Chicago’s technology ecosystem, we focus our attention on the history, current state, and future of incubators, accelerators, co-working spaces and “innovation hubs” in the city. Chicago has always been an industrious city. How that manifests itself, though, has changed quite a bit. Gone are the acres of cows and hogs. The old Illinois Central Railway yard has been converted into Millennium Park. In a bustling city such as this, the hustlers have found other places to work. The trading pits at the Chicago Board of Trade and the options exchange, once thundering and clamorous, are now mostly quiet, replaced by the hum of computer fans in a server room somewhere. However, those brave or crazy enough to start up won’t have to go it alone. As Mattermark mentioned last week, Chicago has a rich history of innovation. But it is also in a period of change. A new generation of entrepreneurs is responsible for building Chicago’s future as a technology ecosystem, and some of them are building those hubs, incubators, and accelerators themselves. In the second installment of a four-part series on the state of technology in the Windy City, we’re focusing on some of the organizations that support new ventures by providing inexpensive, flexible workspace, mentorship, and access to the rich network of business opportunities here. Although Chicago was home to a handful of large Dot-Com companies in the 1990’s (Cars.com and Peapod.com among them), the city lacked a central hub for technology entrepreneurs to work, connect, and share resources. These sorts of formal institutions didn’t really exist during the first Dot-Com Boom, anywhere. It’s easy to forget that organizations and spaces dedicated to serving entrepreneurs didn’t really take off at a national scale until the mid-2000s. The Illinois Technology Association (“the ITA” as almost everyone calls it) was founded in 2005, which, coincidentally, is the same year Y Combinator was founded. It was one of the first industry associations for the technology sector in the city, and it served as a gathering place for entrepreneurs, investors, and enthusiasts alike. (Quick personal note: One of my first hands on experiences in entrepreneurship was the Startup Weekend hosted at the ITA in 2010. Reddit co-founder Steve Huffman delivered the keynote.) The founders of the ITA, Terry Howerton and Fred Hoch, would go on to start TechNexus, an incubator and investment group that helps its corporate partners connect to innovative startups, in 2007. 1871, named for the year of the Great Chicago Fire, opened its doors in 2012. The sprawling incubator and event space on the twelfth floor of the Merchandise Mart today serves as the focal point of Chicago’s tech and innovation ecosystem. Due to scheduling conflicts, we were not able to speak with someone currently at 1871 for this article. We did, however, sit down with Melissa Lederer and Steve Collens, two members of 1871’s founding team, who now run MATTER, a healthcare-focused incubator space located down the hall from 1871. To butcher a physics metaphor, it would be fair to say that Chicago has a lot of “potential energy” when it comes to entrepreneurship and innovation. It has several leading research universities, many nearby colleges with solid business and engineering programs, and a surprising number of Fortune 500 companies headquartered in or near the city. 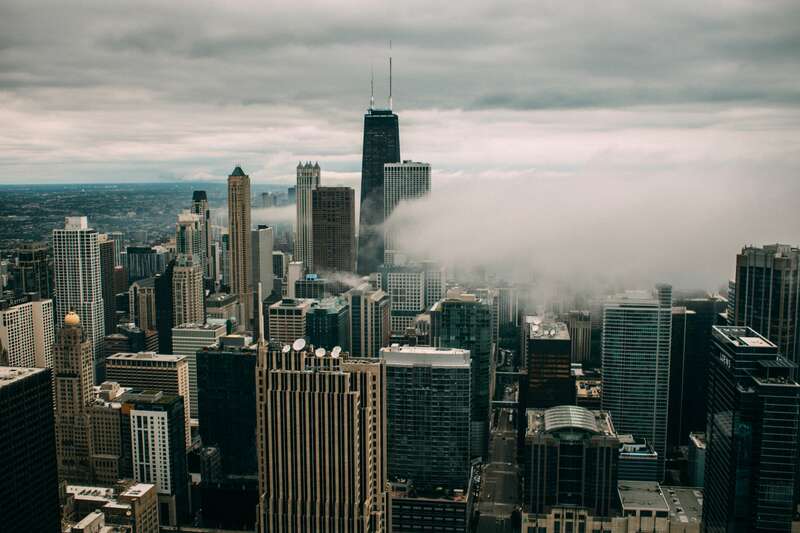 It follows, then, that just a couple of organizations that effectively connected the community catalyzed the growth of Chicago’s entrepreneurial ecosystem. It’s as if these couple of oases allowed a jungle to spring from the desert. Depending on how you count, there are between sixty and eighty innovation hubs, accelerators, incubators, and coworking spaces operating in Chicago today. To visualize the geographic distribution of these organizations, we’ve plotted the locations of 64 of these spaces. “Co-working” spaces are simply communal work spaces for startups and freelancers. “Incubators” offer the same flexible workspace as coworking spaces, but they offer some sort of mentorship or educational program, as well as access to a network of professional service providers and business contacts. “Accelerators” have all the aspects of incubators, but it also makes investments in the companies that participate in the program. The map makes it easy to see that the highest density of startup-oriented spaces is downtown, with some clusters around various university campuses. At least, for now, there aren’t many spaces outside these main clusters, but that might be changing. If Chicago abounds with a veritable jungle of coworking spaces, accelerators, incubators and innovation hubs today, it might be tempting to think that Chicago has hit some kind of peak density. “It’s really interesting that, recently, there are many spaces opening up in Chicago’s neighborhoods [surrounding downtown], and some are starting to work with non-tech businesses,” said Lane. She cited organizations like Blue 1647 on Chicago’s Pilsen neighborhood, which serves as both a coworking space for local startups and independent contractors, as well as a learning lab for students to learn about technology and entrepreneurship. Lane also mentioned Shift, a coworking space located on the north side of the city, a few blocks from Wrigley Field, as another example of innovation centers spreading out from Chicago’s urban center. “It’s a recent trend that we expect to continue throughout 2017,” Lane told Mattermark. Lane also mentioned the trend amongst entrepreneurial spaces toward serving specific industry verticals. With organizations like 1871 supporting early-stage entrepreneurs of all kinds, and Catapult serving more established startups with some more traction—not to mention the other general-audience spaces and programs that have recently sprung up—there is plenty of room for more specialized organizations to find their niche in the city. Like we showed in the first piece in this series, Chicago has a number of industries its startups are best-positioned to find a foothold. 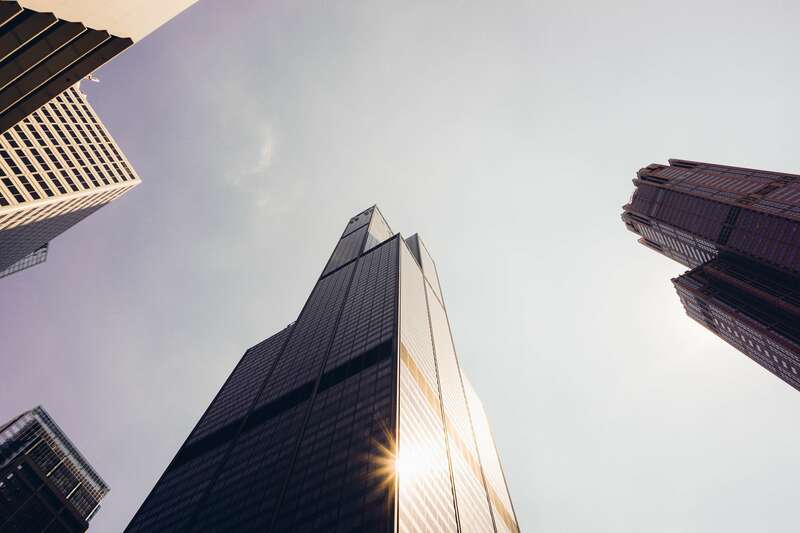 In addition to business services and financial technology, Chicago has maintained a leading position in the healthcare and manufacturing sectors. Two new innovation hubs are positioning themselves to be the leading centers for entrepreneurs working in their respective industries. Unlike 1871, which, again, takes companies of all kinds, the healthcare focus of MATTER allows the organization to select companies that align with some of its corporate partners’ needs for innovation. Steve Collens cited recent trends, like the shift to value-based medical billing (instead of fee-for-service) and electronic health records, as both challenges for big corporations and opportunities for startup companies to provide innovative solutions to such problems. Rather than serving merely as a launchpad for startups in the healthcare space, MATTER’s goal is to help close the loop between startups and the corporations that will be their customers, advisors and, in some cases, investors. If MATTER is focused on nurturing the technologies that will solve the problems of big companies, mHUB’s approach to helping manufacturing and hardware startups is kind of the opposite. Their approach is to bring the resources available at big product development firms to earlier-stage hardware and manufacturing startups. Bill Fienup, Co-Founder and Managing Director of mHUB, admitted to being “kind of spoiled.” An alumnus of MIT and former mechanical design engineer at IDEO, Fienup had access to the best technology and equipment available. On his own as an entrepreneur, though, it was difficult. “A lot of my early startups failed because I just didn’t have access to the resources of a top product development firm [like IDEO] or the professors and mentors I had at MIT,” said Fienup. Noticing that there were other entrepreneurs dealing with similar difficulties, Fienup, together with some partners, opened up Catalyze Chicago, initially out of a 2,500 square foot office. Five months later, Catalyze upgraded to an 8,000 square foot office. Their stats were impressive. In the first two years, Catalyze’s 115 members raised over $21 million in investment, generated $57 million in revenue, shipped over 4 million units of product, and filed over eighty patents. This caught the attention of the City of Chicago. World Business Chicago, an economic development organization chaired by Mayor Rahm Emanuel, approached Catalyze about a partnership. This collaboration would go on to produce mHUB, which, to date, has raised a total of $7M in cash, commitments, and in-kind donations from private donors and corporate sponsors. The organization also received a $500,000 federal grant from the Economic Development Administration. MHUB is now building out a 63,000 square foot, state of the art facility on Chicago Avenue in a building that once housed a Motorola device testing lab. It opens to the public in early 2017. “The goal of mHUB is to lower the barriers to entry for entrepreneurs wanting to build physical product, to connect them to manufacturing partners in industry, and ultimately to solve industry problems here,” said Fienup. With laser cutters, a 3D printing lab, an expansive woodshop, and, among other things, an entire production line left over from Motorola, mHUB hopes to give entrepreneurs and corporate innovation teams a venue for building the initial version of their product, iterating on it, and, ultimately, doing a first production run. For small electronics, a run of 5,000 units would be fairly straightforward to do at mHUB. Chicago’s newer innovation hubs are banking on the idea of “niching down” to serve entrepreneurs and corporations working in industries that already have a strong foothold in the city. MATTER seeks to bring Chicago’s numerous healthcare and life sciences resources together into one venue to innovate and solve the industry’s pressing problems. And, if all goes well, these actions will raise awareness of Chicago’s healthcare innovation community to a national level. MHUB wants to make the prototyping and manufacturing process accessible to startups and give its industry partners front-line access to the people building products at its space. Facilitating connections between entrepreneurs and bigger businesses seems to be a common theme in Chicago’s ecosystem of innovation hubs, incubators, accelerators and coworking spaces. Chicago’s economy is very diverse, and by playing to the city’s industrial strengths, leaders of the city’s entrepreneurial and innovation ecosystem have found their niches and seek to expand from there. If that isn’t industrious, I don’t know what is. Alex Wilhelm, Mattermark’s editor in chief, wrote a number of stories about Catapult for TheNextWeb back when he was based in Chicago. Jason D. Rowley is an independent researcher based in Chicago. His weekly(ish) newsletter on tech, venture capital, and culture is worth reading.